Last week’s Cologne R user group meeting was the best attended so far, and it was a remarkable event - I believe not a single line of R code was shown. Still, it was an R user group meeting with two excellent talks, and you will understand shortly why not much R code needed to be displayed. 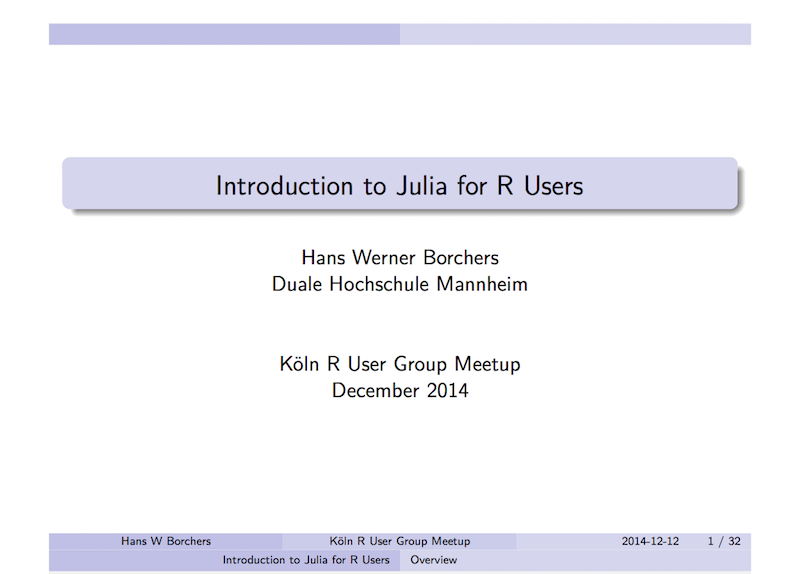 Hans Werner Borchers joined us from Mannheim to give an introduction to Julia for R users. Julia is a high-level, high-performance dynamic programming language for technical computing. The language has gained some considerable traction over the last two years and it was great to get an overview from a familiar perspective. Interestingly, as Hans Werner pointed out, Julia is by far not the only new language around the block. Indeed, over the last decade nearly every year saw the announcement of a new language. Also big tech companies such as Microsoft, Google, Mozilla and Apple are trying to push their own programming languages: F# (2005), Go (2009), Rust (2010) and Swift (2014) respectively. Over the more recent years we notice a movement towards the use of LLVM (Low Level Virtual Machine), on which Julia is based as well and which makes it fast. The just in time compilation demands a little mind shift if you come from R, where the mantra for speed is: vectorise - remove all for-loops. Well, the opposite is true for Julia, because your code will be compiled. For-loops are much easier to understand for the underlying compiler. Hans Werner’s slides provide some good examples to get you started and pointers to further resources. Forecasting time series was the topic of Holger Zien’s talk. Holger gained his first experience with time series during his PhD, when he worked with experimental sensor data. That meant he had lots of data, which could often be regarded stationary as well. Nowadays, his challenges can be very different, sometimes only a few data points from a non-stationary process are available, and yet he is still expected to predict the future. $$ with $\nu_t, \omega_t$ mutually independent random variables. 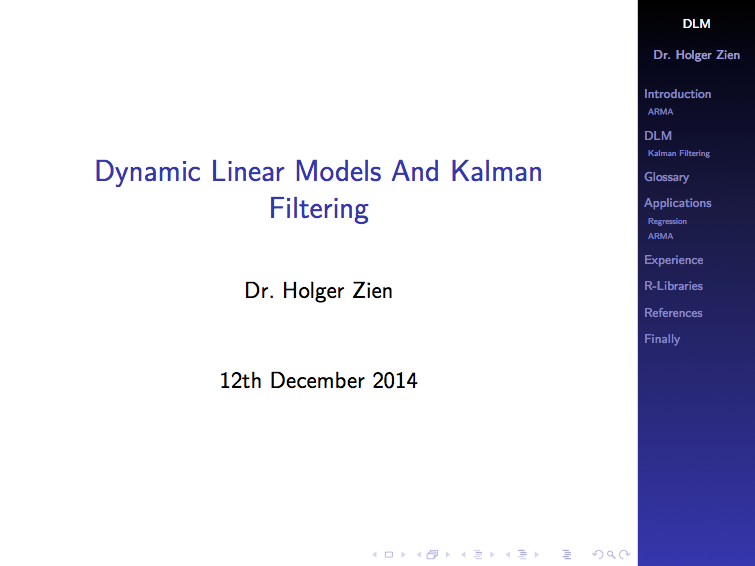 A special case of dynamic linear models is the well known Kalman filter. In the more general case $y_t$ and $\theta_t$ are vectors and $F_t, G_t$ are time variant matrices. Filtering: Estimate of the current value of the state/system variable. Smoothing: Estimate of past values of the state/system variable, i.e., estimating at time $t$ given measurements up to time $t’ > t$. Forecasting: Forecasting future observations or values of the state/system variable. With this introduction outlined Holger showed us how various ARMA and linear regression models can be expressed as dlm. His talk concluded with some remarks about his personal experience and references to various R packages, articles and books. The next meeting is scheduled for 6 March 2015.